Hey Friends!! In this tutorial i will explain you "How to add and use recycle bin on Android" And "Recover deleted file from Android". 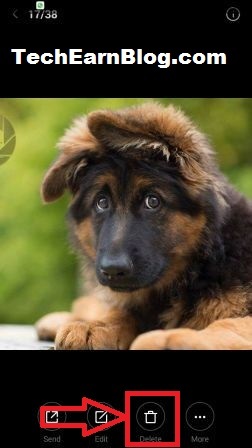 Sometimes, Accidentally we have deleted a important photo or other files from your phone and you need that deleted file back. Does android have recycle bin or trash like computer? Can i recover my deleted files on Android? Which software or application recover my deleted file? 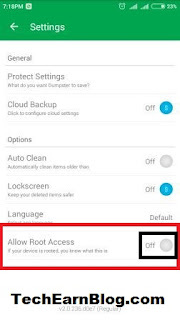 Does i have to root my android phone or not ? >>What is Android Rooting And its benifits. After deleting files, you starting to search recovery software or application but mostly you have to pay or buy to use recovery software. So, In this trick you don't have to buy any software. The Recycle Bin use by windows computer to store deleted items. It temporarily stores files before they are permanently deleted. As we all know Android does not have recycle bin feature but you can add this feature on your Android easily. And the application name is "Dumpster recycle Bin" for Android. Dumpster is equivalent of Recycle Bin for Windows or Trash Can for Mac. 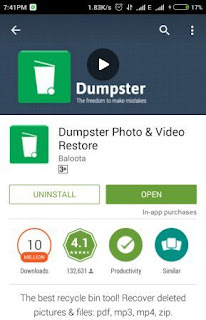 By using this app you can easily add recycle bin on your android and restore deleted files easily. >>How To Easily Earn 5$-10$ per Day Online Easily. #2. Once the installation complete, Open the Dumpster app and click on "Show me how" to learn more or "Skip it". #3. Then, you will see your Recycle Bin is empty. Because it will not recover those files deleted before install dumpster. #4. Now the "Recycle Bin" feature is add on your android. So, delete any file to check this application. #5. Open the "Dumpster app" and search for the file which you have deleted. #6. Now, click on "Restore" button to restore the file or you can permanently delete that file from recycle bin. Note- This app will only recover files deleted after install it, not those files deleted before install dumpster. 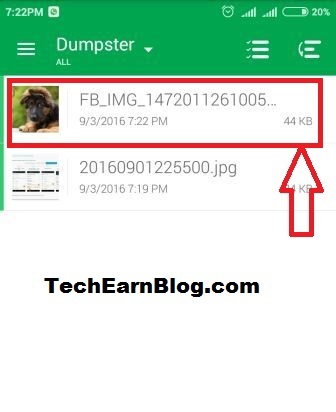 # Dumpster can restore folder and files such as zip, mp4, mp3, jpg, pdf, ogg, rar, text, doc, html, apk, and more. 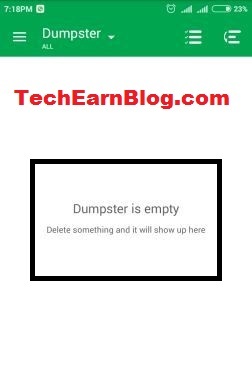 # Dumpster keep your file forever till you manually delete them form dumpster. # It can Recover Uninstalled Apps. # This app will gives you preview of deleted file before restoring. # This app work properly on both rooted and non-rooted android phone. # No internet is required. # Name "One of the 50 best Android apps" by Time Magazine and its play store rating also good. >>How to Get Clash Of Clans Free Gems (No Survey, key, Jialbreak/Root) 100% Working. Open "Dumpster" app >> Go to dumpster settings >> Click on Root access to On it. Note- Set this app to default because whenever you clear ram this app will closed. So friends, now don't worry about deleted files because you can restore it within a minute easily with Dumpster. This is an easy guide on "How to add recycle bin feature on your Android and recover all deleted file from android easily. >>What are the Disadvantage of Android Rooting And its solutions. Keep Visiting TechEarnBlog and Like Facebook page for more useful tricks like this. If you like this post please don't forget to share it because without your support i can't share this knowledge to all android users. Thank you friends for supporting TechEarnBlog. Tags- How to recover deleted data from android, Recover deleted data from android without pc, Add recycle bin for android, best free data recovery software. 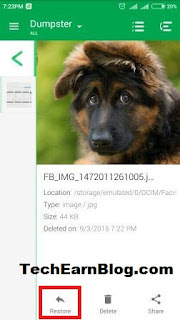 Dr. Fone Toolkit is meant for Android photo recovery and it is been used by millions of people all around the world, and has become famous for the same reason.